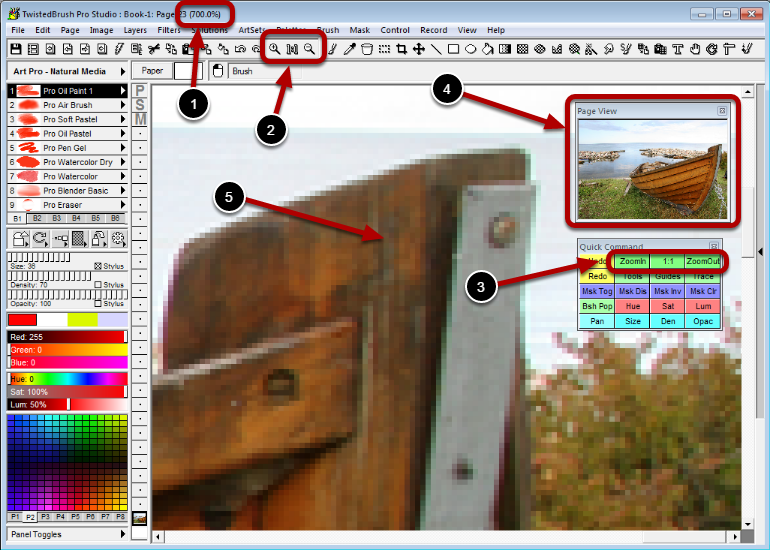 TwistedBrush Pro Studio allows you to Zoom in to work more closely on fine details or Zoom Out to see more of your image that may not fit completely on the screen at the normal zoom level. The title bar shows your current zoom level. Normal zoom is 100%. That is where 1 pixel of your image is display on 1 pixel of your monitor. In this screen capture the zoom level is 700%. You can see we are getting a closer look at the image details. These icons control zooming in (on left), zooming out (on right) and toggling a 1 to 1 zoom. The 1 : 1 option is very handy to get a quick look at the 100% zoom and then return to your previous level of zoom if the 1 : 1 icon is clicked again. Zoom controls are also in the Quick Command panel. The Page View panel will always display your entire image. Notice the blockiness. That is because we are seeing the pixels at 700% zoom. Of special note is the Zoom Fit option. This will select the zoom level so that the entire image is visible in the drawing area. 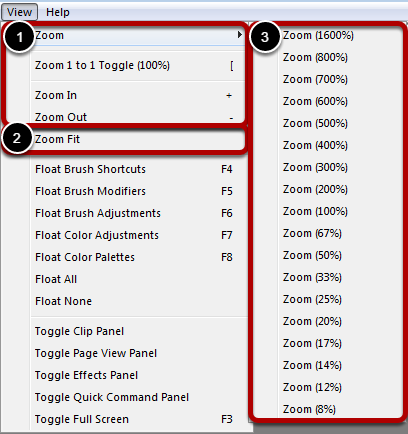 The Zoom sub menu allows you to directly select a zoom level. The mouse wheel can also be used to control zoom. The keyboard + and - keys can also be used to zoom in and out. With the + keyboard key zooming in will be centered on the current location of the pointer.